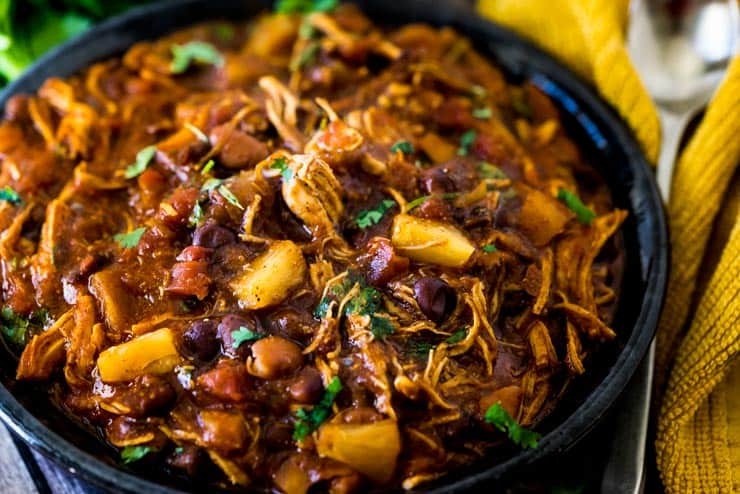 Instant Pot BBQ Chicken Chili Made with Pineapple! My BBQ Chicken Chili is not only easy to make, it’s won a few chili cook-offs, too! It’s saucy, sweet, and has a little bit of a kick. 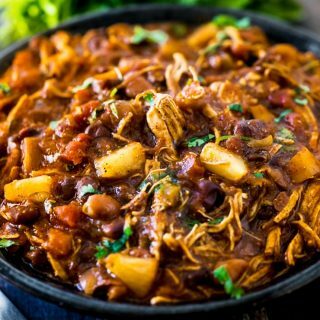 BBQ Chicken Chili- it’s not exactly traditional chili but I’m here to tell you it’s a people pleaser. I’ve taken this chili to multiple chili cook-offs over the years and it just about always wins in at least one of the categories. In fact, just this last weekend it took “Best Non-Traditional Chili” at our church’s Halloween party. I think the zinger in this BBQ Chicken Chili is the addition of pineapple. No one expects to bite down into a piece of juicy pineapple when eating chili, right? 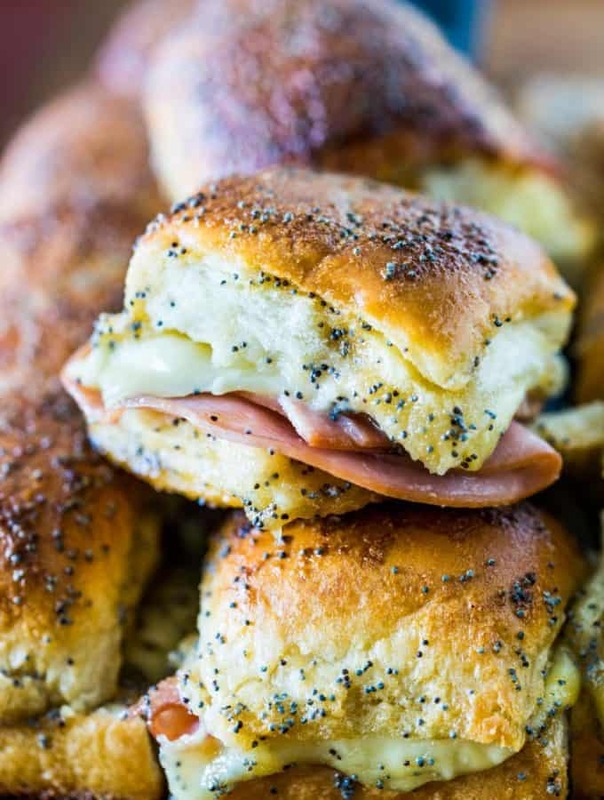 The combo of sweet, spicy, and smoky just works so well. 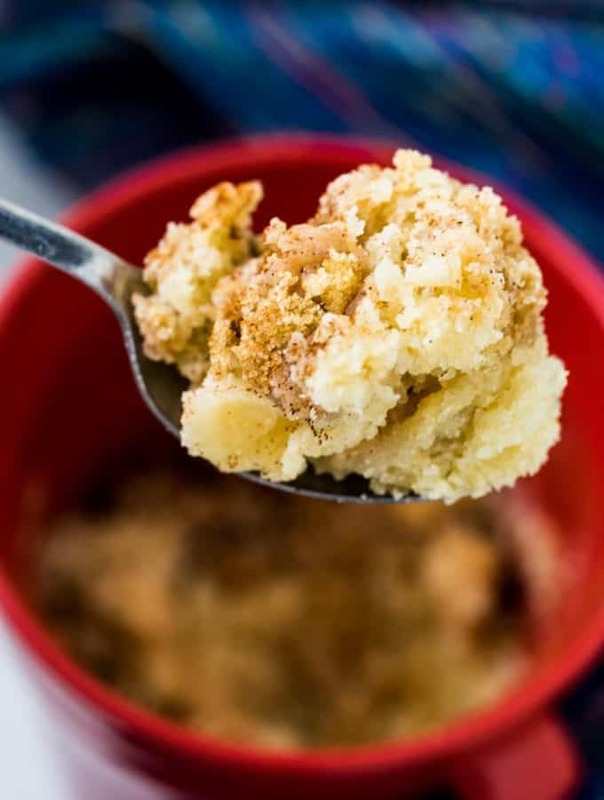 I make this version in my Instant Pot because it’s so quick, but if you don’t have one, no problem! 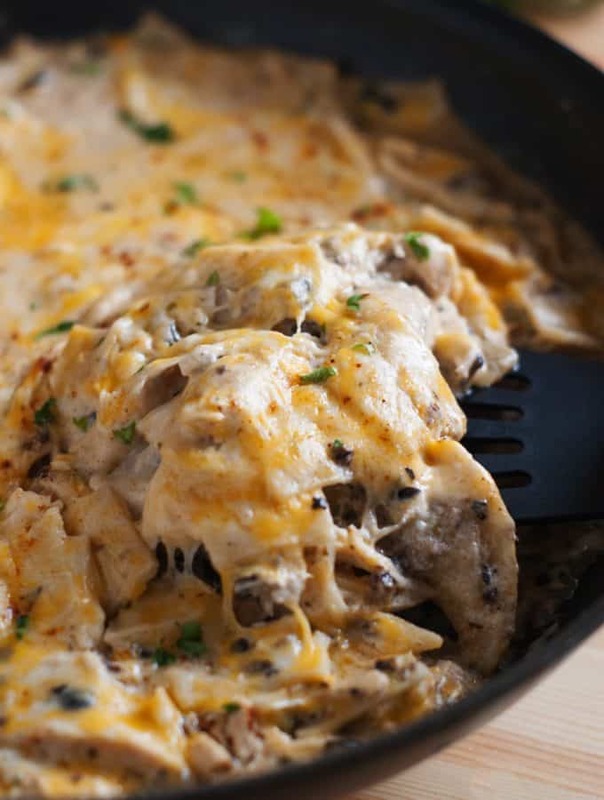 You can easily make this in the slow cooker, too. 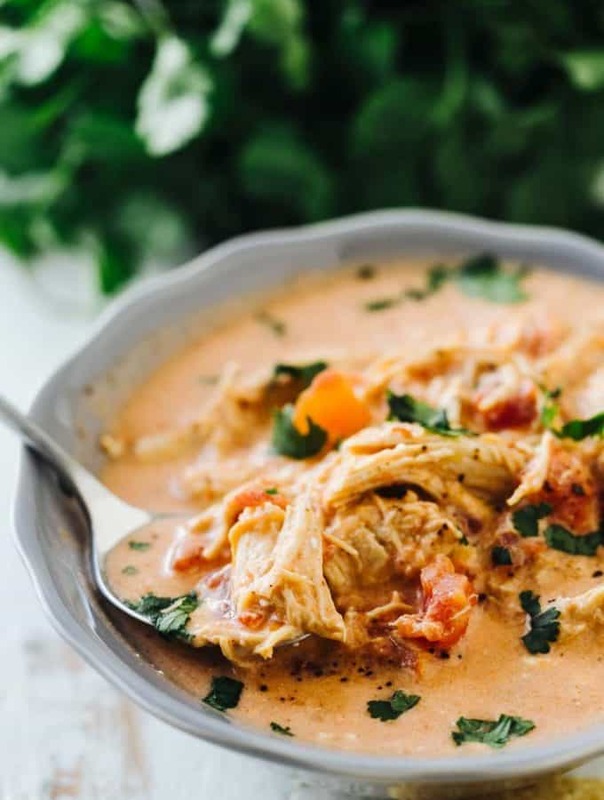 Just brown your chicken on the stovetop and add ingredients to your slow cooker as listed in the recipe. Cook on LOW for 6-8 hours until the chicken shreds easily and continue to follow the directions as written. Smoked Paprika vs. 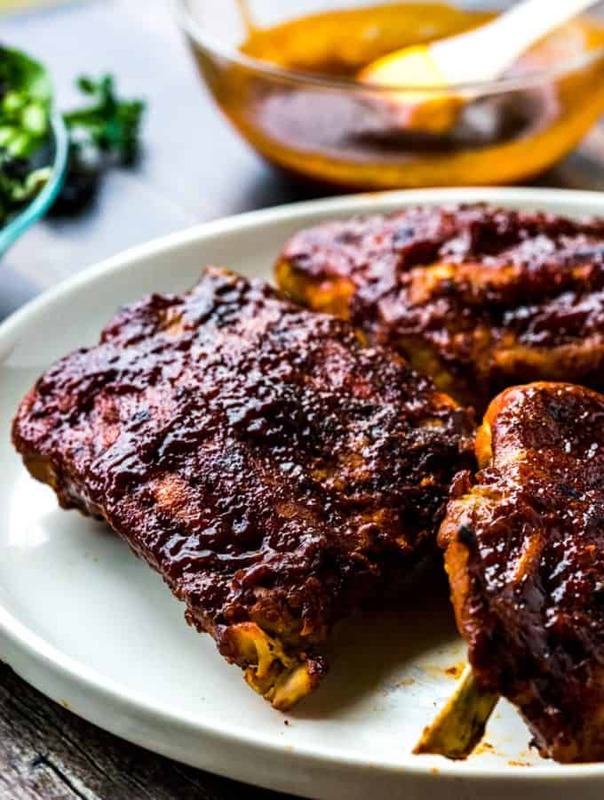 Regular Paprika– using smoked paprika in this recipe really adds that extra smokiness that makes it pop, so I definitely recommend using it if you can. Smoked Paprika can be found in most spice aisles at the grocery store. 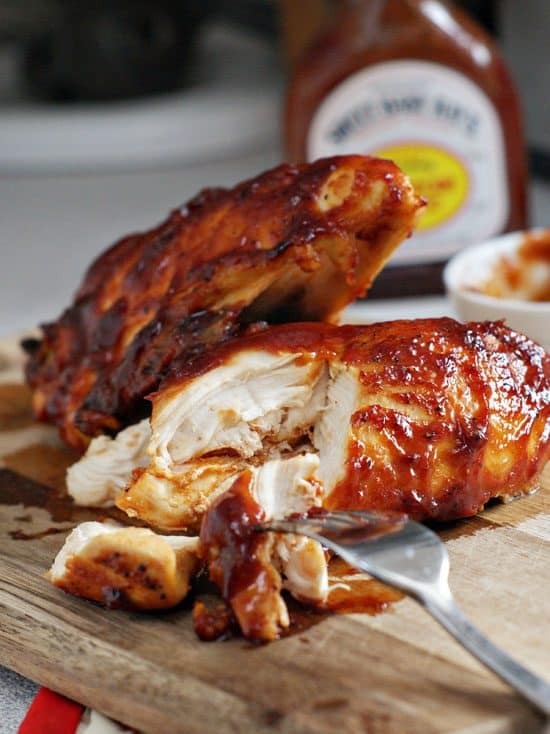 I use it often in recipes where I want just a little bit of smokiness without using liquid smoke or a real-live smoker. 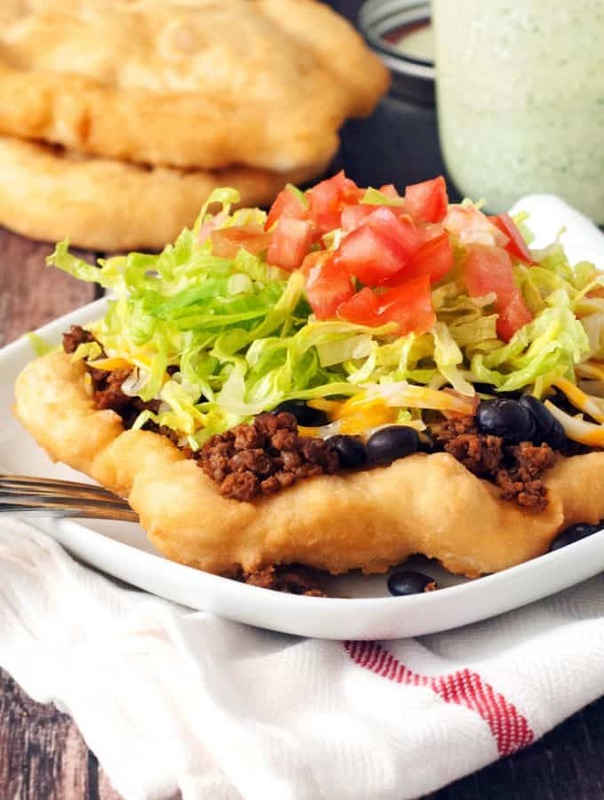 The “Ranch Dressing Mix Step”– as you read through the recipe you’ll see that after the chicken is cooked I toss it in ranch dressing mix before adding back to the chili. 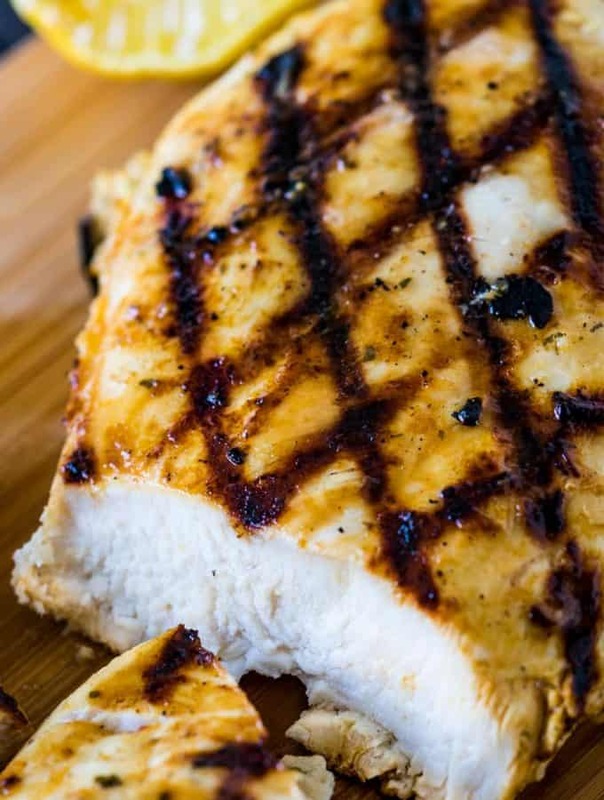 This step may seem odd but it adds just the right amount of flavor and seasons the chicken well. 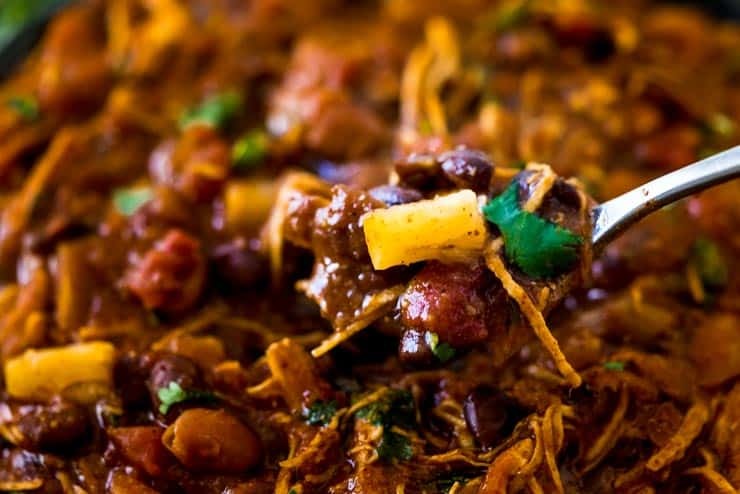 This chili is also fabulous when you substitute a pork roast for the chicken and turns it into BBQ Pulled Pork Chili. 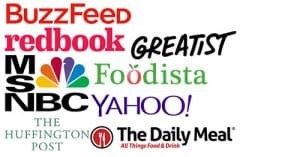 Any kind of bean can be used– Kidney and great northern beans work well, I’m just partial to Pinto and Black. Want More Easy Chili Recipes? 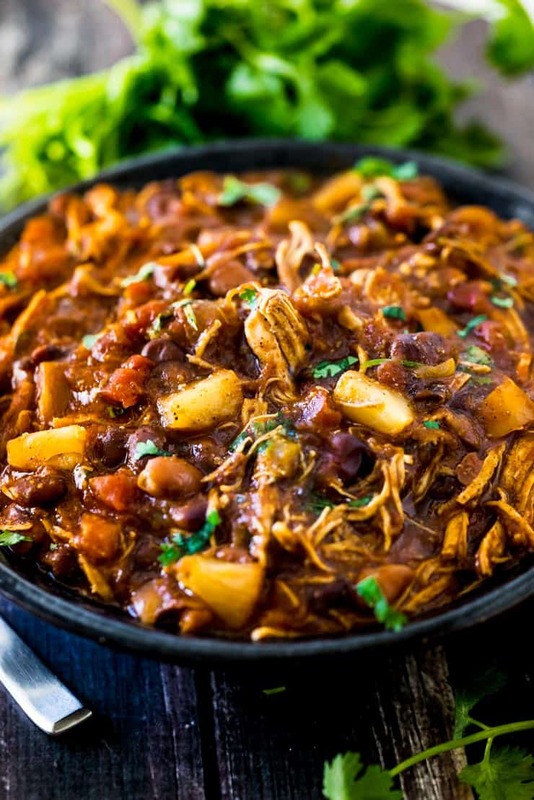 My BBQ Chicken Chili is not only easy to make, it's won a few chili cook-offs, too! It's saucy, sweet, and has a little bit of a kick. Set Instant Pot on "Saute" mode and heat until the display reads "HOT". Add olive oil to the pot. Season chicken with 1/2 teaspoon of salt and the full amount of pepper and brown in the pot until golden brown on both sides. Add onions and bell pepper to the chicken and stir. Continue by adding the chili powder, cumin, ginger, and smoked paprika to the pot. Stir and allow to cook for 1 minute longer. 3/4 cup of the reserved pineapple juice to the pot followed by the Ro-Tel tomatoes, diced tomatoes, beans and BBQ sauce. Stir to combine and place the lid on the Instant Pot. Set the Instant Pot on "Manual' mode and set the timer for 11 minutes. When cooking time is up, allow the pot to release pressure naturally or allow about 10 minutes before doing a manual pressure release. Remove chicken from the chili and set aside on a plate. Set Instant Pot on "Saute" mode once again and bring to a simmer. Sprinkle cornmeal over the chili and stir to combine. Simmer, stirring frequently until slightly thickened. Turn off the Instant Pot. Shred the chicken breasts and sprinkle ranch dressing mix over the chicken, tossing to coat. Return chicken to the chili, followed by the pineapple and cilantro. Stir to combine and serve. When do you add the other 1 tsp of salt? Did I miss it? Been wondering that myself! But it seems to taste good without it! Sorry, don’t know why that was omitted. The remaining salt is to season to taste at the end and I’ve added it to the recipe. I’m glad you enjoyed it! I don’t have a Manual mode on my InstantPot. Hope it works on just 11 minutes with Pressure Cook!!!! Did I miss when the pineapple itself gets added? I just saw the juice. I somehow omitted that! It’s added to the recipe now. You stir them in at the end. Sorry! Printing this out right now, can’t wait to make this! First saw on Instagram!